By Inspire Good Publishing Co.
Do good deeds, and then pass the encouragement on. 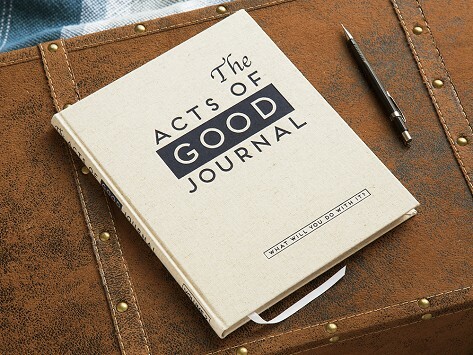 This beautifully made motivation journal inspires you to give back through acts of kindness. Record your story then give the book to someone else to fulfill their own act. Once it has made its way through 12 people (and 12 kindness prompts), the journal is returned to the original owner to keep as an inspirational memento. Dimensions: 8” x 10” x 1"
About Inspire Good Publishing Co.
Adam Benton and the team at Inspire Good Publishing Co. are using their motivation journals as a way to encourage positivity in the world. And their beautifully made Acts of Good Journal and Patriot Notebook do just that, one act of kindness at a time. The folded flag-inspired Patriot Notebook is made to foster patriotism through simple ways to give back to those in the military. Proceeds from each book benefit military families, too. The Acts of Good Journal was made to be passed on. It has 12 prompts to inspire acts of kindness and good deeds. Log your experience and give the journal to someone else who wants to get involved. When the journal's journey is complete, it is returned to the original owner to keep as a memento of all the good it helped create.